While some are trying to take people to Mars or transfer their minds into machines, others are developing ideas that focus on our earthly everyday lives. But it doesn't mean they're less worthy! Bored Panda has compiled a list of awesome inventions and designs you didn't know you needed, and they're as genius as they're simple. From rethinking elevators to coming up with clever pill bottles, these solutions prove the brilliance of simplicity. We're constantly in a rush, trying to do a gazillion things at once, and it's often the little things that get in the way. Scroll down to check out the ways we can tackle them and upvote your favorites! That's cool! And pretty at night too. BONUS! Safety first... well thought out! every beach should have this!! We have these everywhere in my country. Are these not common? I wish everywhere had this. I'm guessing that laundromat doesn't get any kids coming into it. That stuff wouldn't last 5 minutes in the laundromats I've been to. Need this! Need this! Need this! Why aren't they all made this way ? #28 These Chairs In A Ski Resort Restaurant Have Room For Your Gloves, Helmet, Hat Etc. Tragic that such things are needed. This is awesome! I'd love to get this for my garden. Japanese people are so brilliant!! Wow! I think that is a great idea! Cute! I'd love to use this with my girlfriend! Here in India, these days Call and data has gone so cheaper that nobody even cares about them anymore. Much better than having to sleep on the crappy seats in the waiting area. I think this is so cool. Now I just need a car to put it in (I drive a pickup truck). Its really sad that that is even there, much less the graffiti on it. We really need these at the local ACE Hardware stores. Can't get a foot in the door without someone asking to help. I'd need this if I was driving in Ireland. I'm from the US and I know I'd forget which side was the correct side. Do you have Roald Dahl? 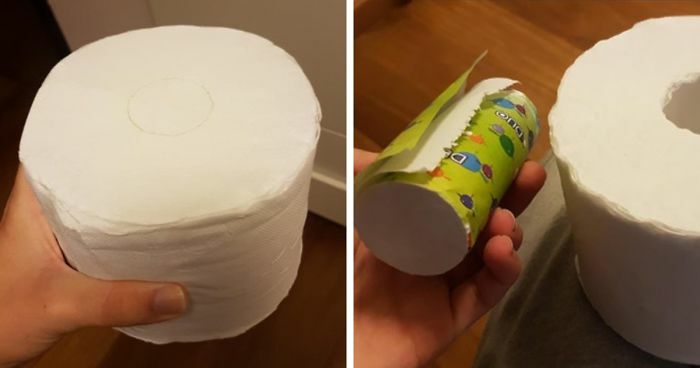 This is much more helpful than those usual capacity shown which is like 68 KG per person..
#59 This Roll Of Toilet Paper Comes With More Paper In The Middle To "Take On The Go"
This is there in India too. This needs to be in every pack of cigarettes. So tired of seeing people toss both still burning and/or the butts out the window. Or for people like me. The one that leaves her reading glasses at home (I'm NOT elderly)! What a great idea! Need this when shopping for make-up too. So... welcome in the future! I would LOVE this! What can I say, I'm just a big KID. We have those too! :) But I don't think they're this cool. Me being the cynical citizen - I wonder if they do repair them, or just hope putting the tags on stops customers whinging. Hiw about " dressing my hamster s as ABBA" books? It's a Calzone, not a Stromboli. Did you... Did you just invent... the normal door?